The results from the first phase of the excavations of the Lead Mosque in the town of Karlovo in Central Bulgaria have been presented at a news conference by lead archaeologist Prof. Margarita Vaklinova and Karlovo Mayor Emil Kabaivanov after wrapping up the digs, reports local news site Top Novini Plovdiv. 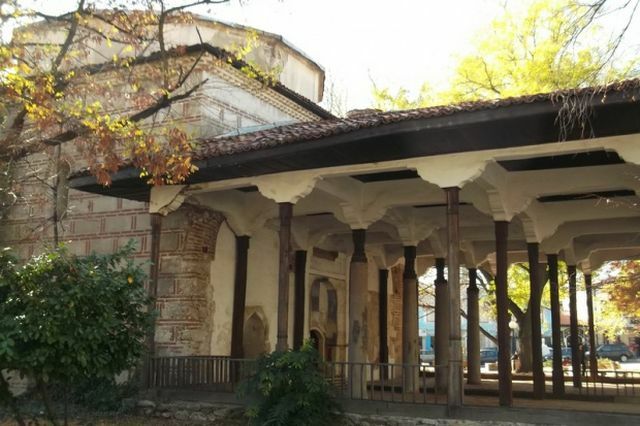 According to the protocol of the expert commission supervising the excavations, which includes Kostadin Kisyov, Director of the Plovdiv Museum of Archaeology, the Lead Mosque in Karlovo must be granted the status of a “monument of culture of national importance” because of the “significance” of the building built in 1485 AD. At present, the temple has the status of a “monument of culture of local importance” despite a proposal that it receive a “national” status made as early as the 1970s. During the completed first phase of the excavations of the mosque the archaeologists have discovered beneath it an Ancient Thracian shrine from the time of the Odrysian Kingdom (5th century BC – 1st century AD), the most powerful state of the Ancient Thracians. The stone structures likely date to the 5th-4th century BC. Among the other artifacts, the archaeologists have found a tetradrachm, a silver coin from the Ancient Greek colony Apollonia Pontica, today’s Bulgarian Black Sea resort town of Sozopol. According to the archaeologists and the local authorities, the rescue excavations of the Lead Mosque in Karlovo must continue inside the temple until the full exposure of the archaeological structures as well as in the area to the east, south, and west of the mosque. The excavations of Kurshum Dzhamiya are expected to be continued in the fall of 2015. “Once the archaeological exploration is completed, Karlovo Municipality will draft a project to seek EU funding for the restoration of the building,” says Karlovo Mayor Emil Kabaivanov regard the plans of the local authorities to turn the mosque into a museum of religions, history and archaeology. Lead archaeologist Margarita Vaklinova has provided more details about her team’s findings including the discovered Ancient Thracian structures as well as the construction of the Ottoman mosque itself. “The entire area [of the mosque] features [traces] of a very active Thracian culture. The very waqfname, i.e. the [Ottoman] document legalizing the construction of the mosque used the phrase “the mound which is located in the cemetery of the infidels”, Vaklinova says. She points out that the mosque is a remarkable, very elegant, and beautiful building, and is one of the few mosques preserved from a period when the Ottoman Empire was at its height. The mosque is relatively small – it has an area of about 100 square meters – leading the archaeologists and historians to conclude that it was built for a small community of worshipers. The building itself is well preserved unlike its murals which are only partly preserved. It bears traces from three archaeological periods – the 15th century when it was built, as well as the 17th century, and the period of the Bulgarian National Revival, the 18th-19th century, Vaklinova has explained. During the second phase of the excavations of the Lead Mosque in Karlovo in the fall of 2015, the Bulgarian archaeologists are going to explore its interior; they expect to find the most interesting traces from the ancient and medieval history of the site in the center of the building. Vaklinova points out that the region of Karlovo is very rich in archaeological finds, and that the Lead Mosque can be turned into a wonderful museum gathering all of the discovered artifacts; in order for it to receive EU funding for restoration works, however, the temple has to be granted the highest “monument of culture” status there is by the Bulgarian Ministry of Culture.